"I want to find a way to live that keeps me involved in what God is doing in me and in the world around me. Do you know a way to live that is like that?" 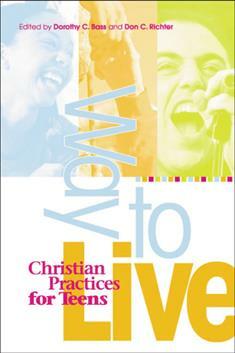 Eighteen teens and 18 adults tackle that question in Way to Live: Christian Practices for Teens. Their different points of view and personal stories make living a Christian life real. "This book invites you into a community of people who don't just go with the flow," say the editors. "This community's image of 'the good life' is not about having lots of stuff or being more successful than other people. Instead, it's about getting involved in the loving, challenging life of God." Find out how Alexx dealt with all his stuff, how Marie expressed her creativity with a paint roller, what Jack learned about play. These are just a few of the Christian practices this team of writers explores. Some ancient Christian practices turn up as ways to deepen awareness of God's presence in our lives today. Discover how to use your imagination when reading the Bible—ß la Saint Ignatius—and practice tuning in to God like Brother Lawrence of the 17th century. This fun, graphics-filled book will start teens on the spiritual journey of a lifetime!